In Topeka, Kansas, someone made a post to a local Facebook page asking for help with a critically injured five month old puppy. The puppy had made his way onto a porch and collapsed. At first they couldn’t even tell that it was a dog. 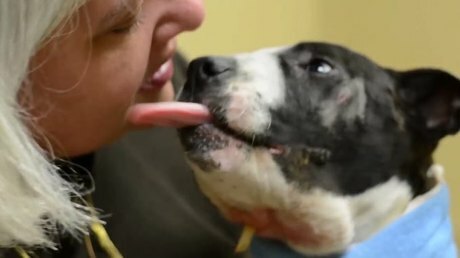 The pit bull puppy was suffering life threatening injuries that included, gaping wounds to his head and neck that were more than likely from being used as bait in a dog fighting ring. The puppy spent two weeks in intensive care. He was named Jax at some point along the way. One of staffers at the veterinary hospital remembers that when she first saw Jax, he did not even look like a puppy. His face was so swollen and he had incurred such horrific injuries that you couldn’t tell what he was. She did not know anything about him but visited Jax every day and made it her mission to give him as much love as possible. Every night she would visit him and sit with him. On her first visit, she recalled him wagging his tail a few times. As his condition improved, she would notice his tail wag just a little bit longer. Soon she could see his little doggie spirits perking up, when she stopped by and he was even starting to get that cute little happy puppy smile. 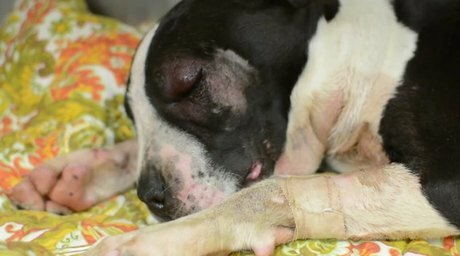 After two weeks, the puppy was released from the emergency center, and placed in a foster home. Small dogs and puppies like Jax are often used as bait in dog fighting rings. Bait animals are used for training, to test another dog’s fighting instinct. 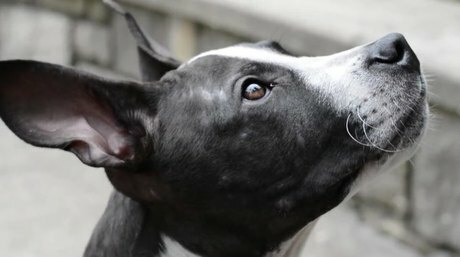 Larger dogs are also used as bait, except their mouths are often duct taped shut so they can’t fight back and risk injury to the fighting dog. When bait animals have served their purpose, they are killed, or released to quietly die alone. Participation is Dog Fighting is a felony offense in all fifty states, it is also a felony offense under federal law as well.